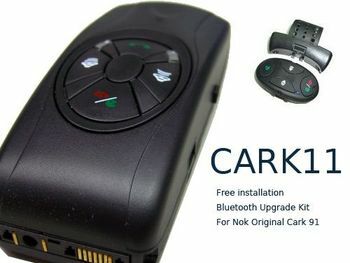 Introducing our Cark 11 free installation Bluetooth upgrade solution for Original Cark 91 Cark Kit. The easiest and simplest way to transform your customers old Cark 91 handsfree car kit to equip with the latest Bluetooth function which is compatible with your Bluetooth mobile phones. Simply plug-in our Cark 11 in the Cark 91 cradle to upgrade the old system instantly. Your customers can easily connects their mobile phones with Cark 11 Upgrade Kit by using the standard Bluetooth technology built-in their phones. Each Cark 11 can pair up to 4 Bluetooth mobile phones in its memory at the same time and there will be an automatically re-connections with these phones as soon as user enter into the car and turn on the ignition. Your customers have the choices of either surface control panel or optional wireless remote control depending on their requirements. Surface control panel provides a very price competitive solution for your customer while optional wireless remote control offers total freedom and safest handsfree operation throughout the whole driving. Both surface control panel and wireless remote control are easy to control and operate. Comes with a professional and stylish wireless remote control placed on steering wheel for easy use and sophisticated look.